Line 8- or 9-inch square pan with foil so foil extends about 2 inches over sides of pan. Lightly spray foil with cooking spray. In large microwavable bowl, microwave chocolate chips uncovered on High 1 minute. Stir until melted. 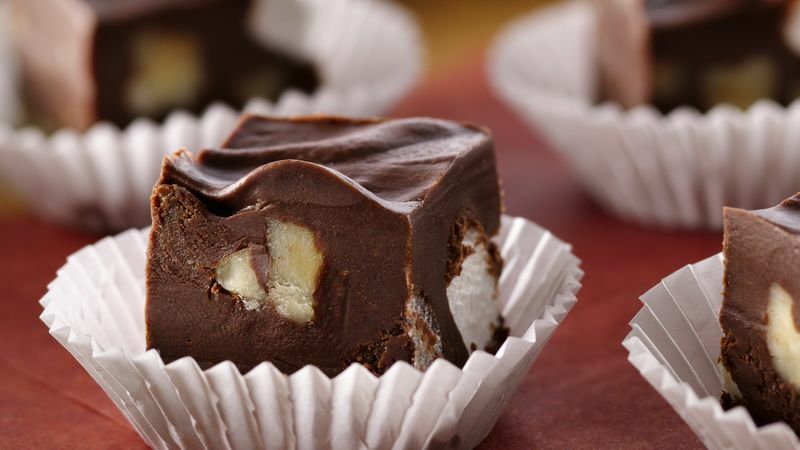 If necessary, microwave 10 to 20 seconds longer or until chocolate can be stirred smooth. Microwave frosting uncovered on High 20 seconds. Stir into melted chocolate chips. Add milk and vanilla; stir at least 20 strokes with spoon until smooth and creamy. Stir in marshmallows and walnuts. Spread in pan. Refrigerate about 3 hours or until firm. Remove fudge from pan by lifting foil; remove foil. Cut 8 rows by 8 rows to make squares. Store tightly covered in refrigerator up to 2 weeks. Play with the flavors—vanilla frosting with toasted coconut and chopped macadamia nuts? The possibilities are endless.